Two trips to Powell's, people. Sometimes I'm glad Powell's is well beyond one-day driving distance from Chicago. That place is a danger to book lovers everywhere. 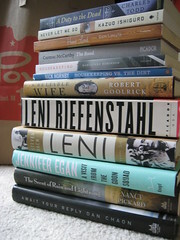 Somehow, I ended up with two Leni Riefenstahl books because one was $3.95. Less than lunch at McDonalds! Had to buy it.